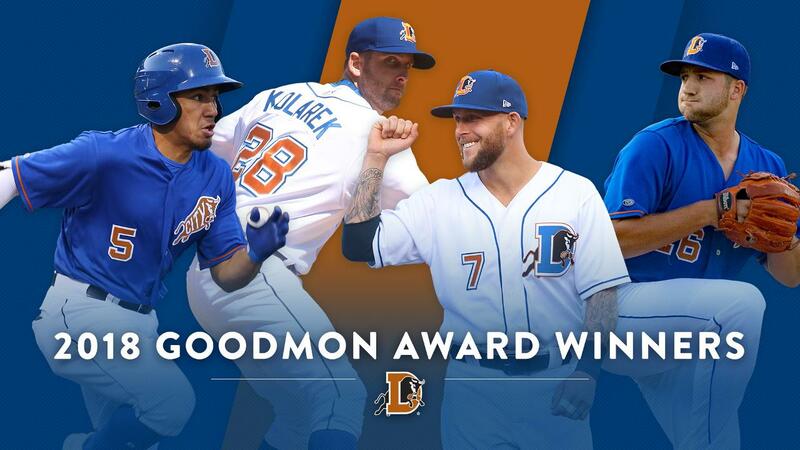 Prior to the Durham Bulls' final home game of the regular season on Monday, the team will recognize the winners of the 2018 Goodmon Awards. The 25th annual Goodmon Awards, named for Capitol Broadcasting CEO Jim Goodmon, acknowledge Bulls players for their contributions to the success of the team on and off the field. Infielder/outfielder Kean Wong has been selected as the team's Most Valuable Player, ranking 10th in the IL with a .283 batting average. The 23-year-old leads the team in hits (123) and on-base percentage (.346), and was named a 2018 International League Postseason All-Star earlier in the week. Left-handed reliever Colin Poche is the team's Pitcher of the Year, holding a mark of 4-0 with a 1.13 ERA in 27 outings. Acquired from the Arizona Diamondbacks in May, the Texas native has struck out 75 batters in just 48 innings, while surrendering only 27 hits. With the Bulls, the 24-year-old has struck out over 41 percent of the batters he's faced. Infielder Brandon Snyder has been selected for the Goodmon Award for Team Spirit. The 31-year-old, in his first season with Durham, ranks seventh in the league with a .460 slugging percentage, and leads the team in home runs (16) and RBI (57). The Team Spirit award is presented annually to the player who most consistently exhibits a good attitude on and off the field. Now with the Tampa Bay Rays, Adam Kolarek has been selected as the recipient of the Community Service award. The left-handed reliever took an active role in the Bulls' involvement with the Miracle League of the Triangle while in Durham.